Home » Posts Tagged "Couder Y." Abstract : The back-reaction of a radiated wave on the emitting source is a general problem. In the most general case, back-reaction on moving wave sources depends on their whole history. Here we study a model system in which a pointlike source is piloted by its own memory-endowed wave field. 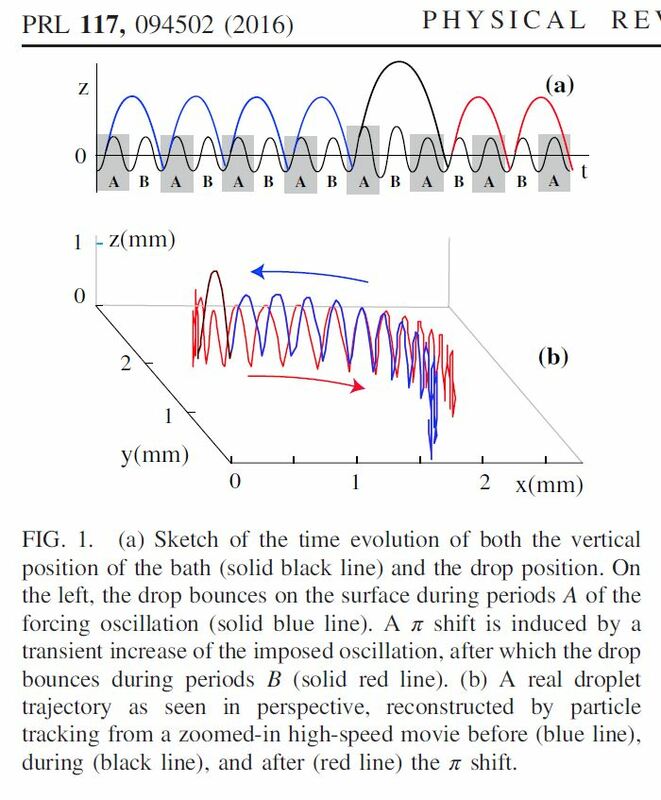 Such a situation is implemented experimentally using a self-propelled droplet bouncing on a vertically vibrated liquid bath and driven by the waves it generates along its trajectory. The droplet and its associated wave field form an entity having an intrinsic dual particle-wave character. The wave field encodes in its interference structure the past trajectory of the droplet. In the present article we show that this object can self-organize into a spinning state in which the droplet possesses an orbiting motion without any external interaction. The rotation is driven by the wave-mediated attractive interaction of the droplet with its own past. The resulting “memory force” is investigated and characterized experimentally, numerically, and theoretically. Orbiting with a radius of curvature close to half a wavelength is shown to be a memory-induced dynamical attractor for the droplet’s motion. Labousse, M., Perrard, S., Couder, Y., & Fort, E. (2016). Self-attraction into spinning eigenstates of a mobile wave source by its emission back-reaction. Physical Review E, 94(4), 042224. Perrard, S., Fort, E., & Couder, Y. (2016). Wave-Based Turing Machine: Time Reversal and Information Erasing. Physical Review Letters, 117(9), 094502. The investigation of dynamical systems has revealed a deep-rooted difference between waves and objects regarding temporal reversibility and particlelike objects. In nondissipative chaos, the dynamic of waves always remains time reversible, unlike that of particles. Here, we explore the dynamics of a wave-particle entity. It consists in a drop bouncing on a vibrated liquid bath, self-propelled and piloted by the surface waves it generates. This walker, in which there is an information exchange between the particle and the wave, can be analyzed in terms of a Turing machine with waves as the information repository. The experiments reveal that in this system, the drop can read information backwards while erasing it. The drop can thus backtrack on its previous trajectory. A transient temporal reversibility, restricted to the drop motion, is obtained in spite of the system being both dissipative and chaotic. Borghesi, C., Moukhtar, J., Labousse, M., Eddi, A., Fort, E., & Couder, Y. (2014). 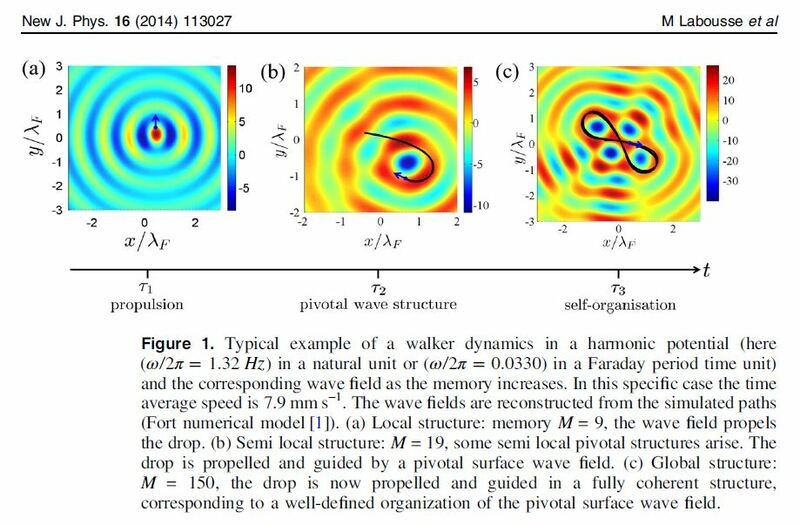 Interaction of two walkers: Wave-mediated energy and force. Physical Review E, 90(6), 063017. A bouncing droplet, self-propelled by its interaction with the waves it generates, forms a classical wave-particle association called a “walker.” Previous works have demonstrated that the dynamics of a single walker is driven by its global surface wave field that retains information on its past trajectory. 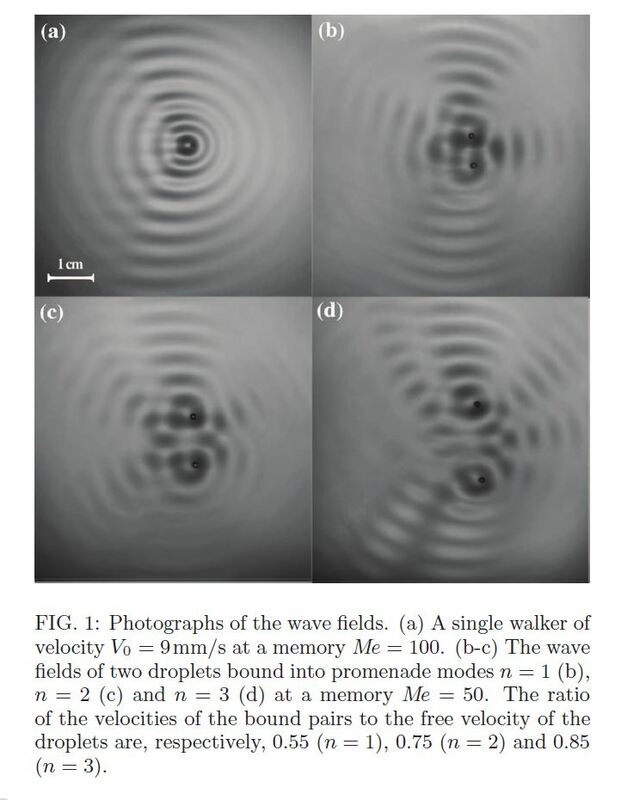 Here, we investigate the energy stored in this wave field for two coupled walkers and how it conveys an interaction between them. For this purpose, we characterize experimentally the “promenade modes” where two walkers are bound, and propagate together. Their possible binding distances take discrete values, and the velocity of the pair depends on their mutual binding. The mean parallel motion can be either rectilinear or oscillating. The experimental results are recovered analytically with a simple theoretical framework. A relation between the kinetic energy of the droplets and the total energy of the standing waves is established. Labousse, M., Perrard, S., Couder, Y., & Fort, E. (2014). Build-up of macroscopic eigenstates in a memory-based constrained system. New Journal of Physics, 16(11), 113027.
scale, if the walker is spatially confined, the pivots become the building blocks of a self-organization into a global structure. This new theoretical framework is applied in the presence of an external harmonic potential, and reveals the underlying mechanisms leading to the emergence of the macroscopic spatial organization reported by Perrard et al (2014 Nature Commun. 5 3219). A droplet bouncing on a vertically vibrated liquid bath can be self-propelled by the surface waves it generates. Theses Faraday waves are sustained by the vertical bath vibration for a memory time which can be tuned experimentally. The wave field thus contains in its interference pattern a memory of the past-trajectory. The resulting entity called a walker is characterized by the interaction between the drop and its surrounding waves through this path-memory. This thesis is devoted to an experimental and theoretical investigation of such a wave-mediated path-memory. For this purpose a bouncing drop is magnetically loaded with a droplet of ferrofluid and can then be trapped in an harmonie well. The drop is thus forced to interact with its own path. The confinement induces a self-organization process between the particle and its wave packet, leading to wave-type behavior for a particle. Notions such quantization or probability of measuring an eigenstate can thus be used for the walker dynamics description. These features originate from the temporal coherence of the walker’ s dynamics. In that sense, the walker is an entity extended in time, we cannot reduce to a point-like approximation. It reminds us, in another context, the pilot wave theory developped by de Broglie at the beginning of the XXst century. Perrard, S., Labousse, M., Fort, E., & Couder, Y. (2014). Chaos driven by interfering memory. Physical review letters, 113(10), 104101. Labousse, M. (2014). Étude d’une dynamique à mémoire de chemin: une expérimentation théorique (Doctoral dissertation, Université Pierre et Marie Curie UPMC Paris VI). Perrard, S., Labousse, M., Miskin, M., Fort, E., & Couder, Y. (2014). Self-organization into quantized eigenstates of a classical wave-driven particle.Nature communications, 5. A growing number of dynamical situations involve the coupling of particles or singularities with physical waves. In principle these situations are very far from the wave particle duality at quantum scale where the wave is probabilistic by nature. Yet some dual characteristics were observed in a system where a macroscopic droplet is guided by a pilot wave it generates. Here we investigate the behaviour of these entities when confined in a two-dimensional harmonic potential well. A discrete set of stable orbits is observed, in the shape of successive generalized Cassinian-like curves (circles, ovals, lemniscates, trefoils and so on). Along these specific trajectories, the droplet motion is characterized by a double quantization of the orbit spatial extent and of the angular momentum. We show that these trajectories are intertwined with the dynamical build-up of central wave-field modes. These dual self-organized modes form a basis of eigenstates on which more complex motions are naturally decomposed. 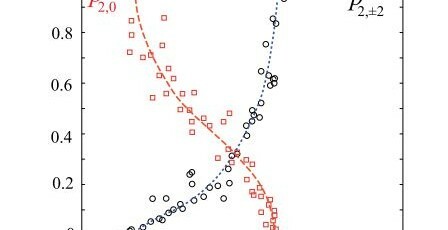 Perrard, S., Labousse, M., Miskin, M., Fort, E., & Couder, Y. Effets de quantification d’une association onde-particule soumise à une force centrale.Résumés des exposés de la 16e Rencontre du Non-Linéaire Paris 2013, 68. Harris, D. M., Moukhtar, J., Fort, E., Couder, Y., & Bush, J. W. (2013). 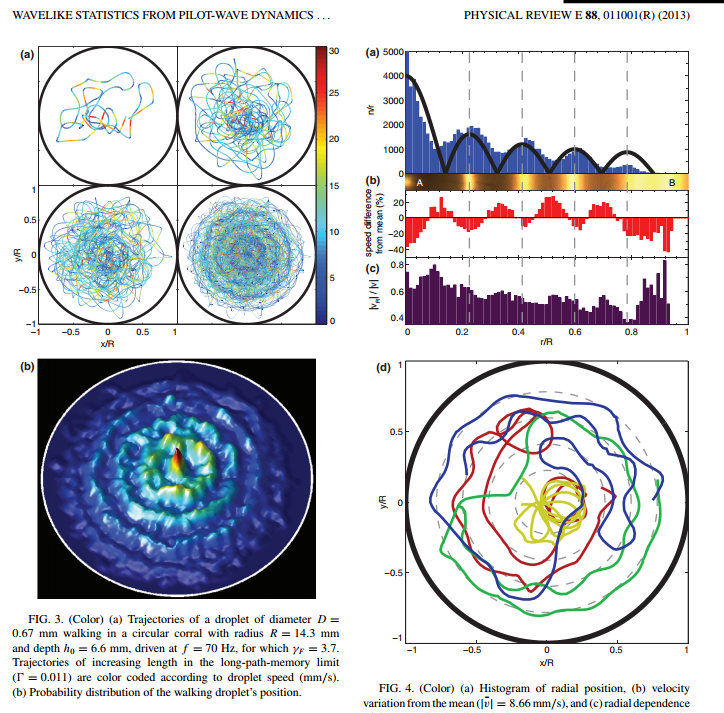 Wavelike statistics from pilot-wave dynamics in a circular corral. Physical Review E, 88(1), 011001. Abstract : Bouncing droplets can self-propel laterally along the surface of a vibrated fluid bath by virtue of a resonant interaction with their own wave field. The resulting walking droplets exhibit features reminiscent of microscopic quantum particles. Here we present the results of an experimental investigation of droplets walking in a circular corral. 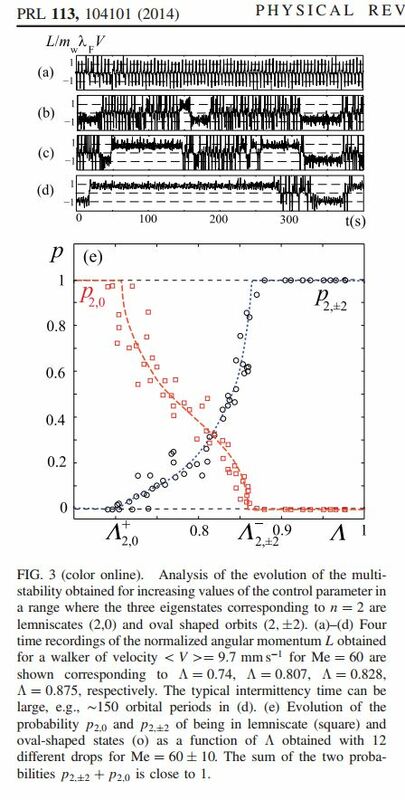 We demonstrate that a coherent wavelike statistical behavior emerges from the complex underlying dynamics and that the probability distribution is prescribed by the Faraday wave mode of the corral. The statistical behavior of the walking droplets is demonstrated to be analogous to that of electrons in quantum corrals. Eddi, A., Decelle, A., Fort, E., & Couder, Y. (2009). Archimedean lattices in the bound states of wave interacting particles. EPL (Europhysics Letters), 87(5), 56002. Fort, E., Eddi, A., Boudaoud, A., Moukhtar, J., & Couder, Y. (2010). Path-memory induced quantization of classical orbits. Proceedings of the National Academy of Sciences, 107(41), 17515-17520. Eddi, A. (2011). Marcheurs, Dualité onde-particule et Mémoire de chemin (Doctoral dissertation, Université Paris-Diderot-Paris VII). Eddi, A., Moukhtar, J., Perrard, S., Fort, E., & Couder, Y. (2012). Level Splitting at Macroscopic Scale. Physical Review Letters, 108(26), 264503. Protière, S., Boudaoud, A., & Couder, Y. (2006). Particle-wave association on a fluid interface. Journal of Fluid Mechanics, 554(10), 85-108. Couder, Y., Fort, E., Gautier, C. H., & Boudaoud, A. (2005). From bouncing to floating: Noncoalescence of drops on a fluid bath. Physical review letters,94(17), 177801. Protiere, S. (2007). Gouttes rebondissantes: une association onde-particule à échelle macroscopique (Doctoral dissertation, Université Paris-Diderot-Paris VII).